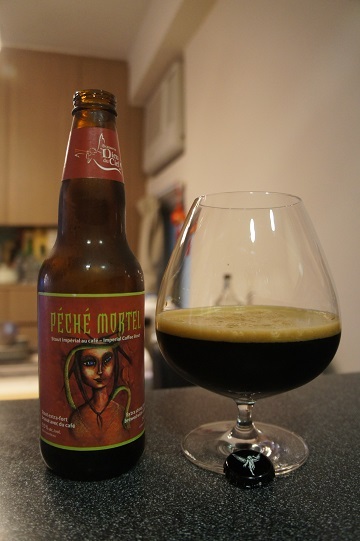 Brewer Description: (from website) Aphrodite is a dark ale brewed with cocoa and vanilla beans. Its flavour profile offers dark chocolate, bourbon and roasted malt tones. Gentle sweetness from the vanilla harmonizes alongside the bitterness of cocoa, presenting a subtle and surprisingly balanced finish. 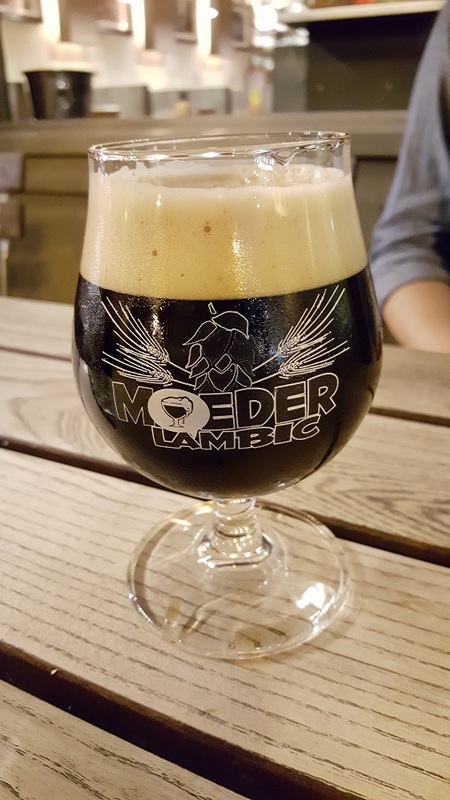 Intro: A 250ml pour on tap at Moeder Lambic Fontainas into a Moeder Lambic snifter glass. Appearance: It was a pitch black colour with a just less than two finger tanned head that had great retention and lacing. Aroma: Dark chocolate, vanilla and coffee bean. Taste: Dark chocolate truffles with vanilla and a light bitterness. Mouthfeel: Smooth, medium to light bodied with light carbonation. Overall: Looks and smells great. Body is a bit on the light side, but it was smooth and well balanced. One of the best stouts out there. Other Notes: Extra strong Stout brewed with coffee. 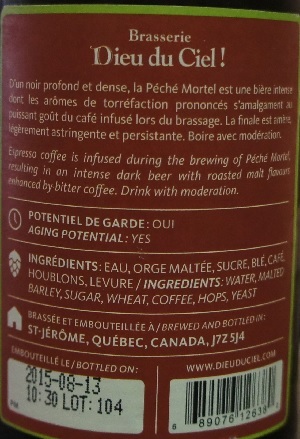 Brewer Description: (from website) A deep, dark and profound stout. 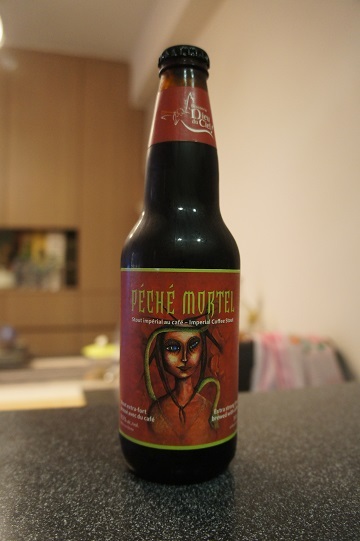 Espresso coffee is infused during the brewing of Péché Mortel, resulting in an intense dark beer with roasted malt flavours enhanced by bitter coffee. The dry finish is long and persistent. Intended as a tasting experience, we invite you to enjoy this brew in moderation. Intro: A 341ml bottle with a bottled on date of 13th August 2015 and poured into a snifter glass. Appearance: It poured a deep dark brown, near black colour with a less than one finger tanned head that disappears fairly quickly but leaves nice small spotty lacing. Aroma: Strong coffee, espresso, sweet black cherry and vanilla, roasty malts and a hint of dark chocolate. Taste: Very nice coffee, roastiness, lightly charred with a finish that is a lingering dark chocolate bitterness. Mouthfeel: Smooth velvety, full bodied with low carbonation. 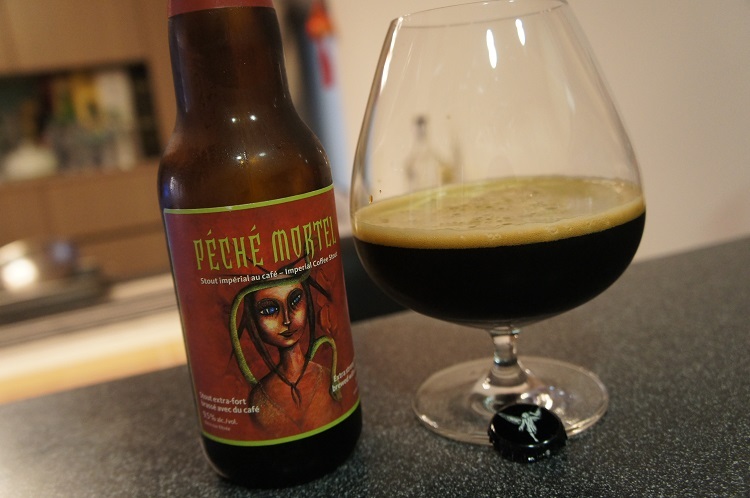 Overall: Very nice coffee stout that I could drink again and again. Will definitely age a few bottles since it does suggest that on the back label. Would also love to try a barrel-aged version of this bad boy.